Located on the east bank of the Kennebec River across the bridge from Waterville, the town of Winslow is rich in history and pride. Settlers arrived in the early 1700s and built their homes around the protective “Fort Halifax” on the confluence of the Sebasticook and Kennebec Rivers, major routes in transporting food, goods, and more settlers. 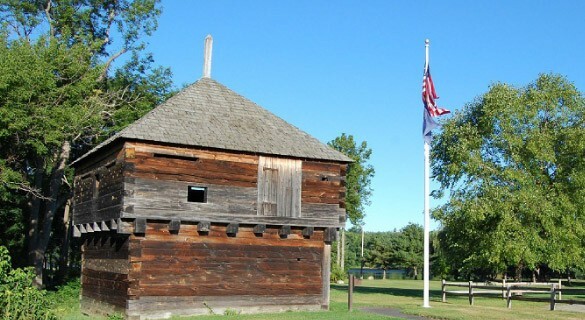 The Winslow Fort Halifax Blockhouse, formerly the nation’s oldest wooden structure of its type, was rebuilt from some of the timbers of the original blockhouse that was swept down the Kennebec River by raging flood waters on April 1, 1987. Winslow has a population of approximately 8,000 and provides excellent commercial, industrial, and residential opportunities. Johnny’s Selected Seeds, one of the world’s top rated seed catalog companies, is open for business on Benton Avenue in Winslow. Mid-State Machine Products, one of Maine’s largest manufacturers of specialty machinery, is favorably located on Route 201. Elanco is located on Route 137 and is a leading manufacturer and supplier of poultry biologics for the U.S. and international vaccine markets. A stable, council-manager govern-ment has operated under a Town Charter since 1969. Winslow has successfully maintained one of the more attractive property tax rates in the area and can boast an excellent educational system, outstanding athletic programs, and some of the finest recreational facilities in the state. Winslow is a warm, friendly, progressive community and an excellent place to call home.